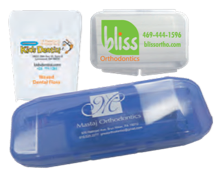 Don’t spend your marketing dollars promoting national brands – Maximize your investment in patient giveaways by ordering our premium dental products decorated with your office logo in full color. OraBrite offers a full catalog of oral care items available for imprint, not just toothbrushes. Interested in floss, dental kits, interdental cleaners; We have you covered with over 1000+ oral care items to select from. OraBrite offers high resolution, digital four color process and pad printing to assure we can replicate your colorful logo exactly. Looking for custom color printing, we have you covered. Looking for help developing a logo of your own- we can help with that too. OraBrite offers direct customer contact with our Graphic Artist to help make your imprint exactly what you want it to be. Look for these icons to represent printing options for each product. 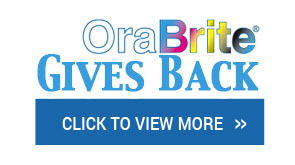 Ordering personalized toothbrushes from OraBrite is easy. Upload your logo, and if it needs to be adapted for full color printing or vectorized, we will take care of that for you! With our online tools, selecting a brush and uploading or designing your imprint is easy. You even get an instant virtual proof. If you are not satisfied with your purchase or decorated items, OraBrite will work with you to get it perfect. We know that dental office promotion is vital to your business and we want to help your business succeed. Order with us today and your image, the way you drew it up, can be in your patients’ hands in a week. Call us now toll free: (888)296-6730.